Our new survey of 40 nations finds that ratings for the U.S. remain mostly positive, with a global median of 69% expressing a favorable view of America and many abroad continuing to voice confidence in President Barack Obama. Perceptions of the U.S. as an economic power have also improved. There is support for the U.S. campaign against ISIS but also negative views of tactics the U.S. has used in its anti-terrorism campaign. The survey also assessed the world standing of China, whose overall ratings are mostly favorable, though its image is far more negative when it comes to protecting the personal freedoms of its citizens. 1There is extensive global support for the U.S. military campaign against ISIS, with a median of 62% across the countries surveyed supporting American military efforts against the group in Iraq and Syria. Eight-in-ten Americans back the campaign, including large majorities of Republicans, Democrats and independents. The campaign also has support in the Middle Eastern nations surveyed, including some countries where U.S. foreign policy has been unpopular in recent years. 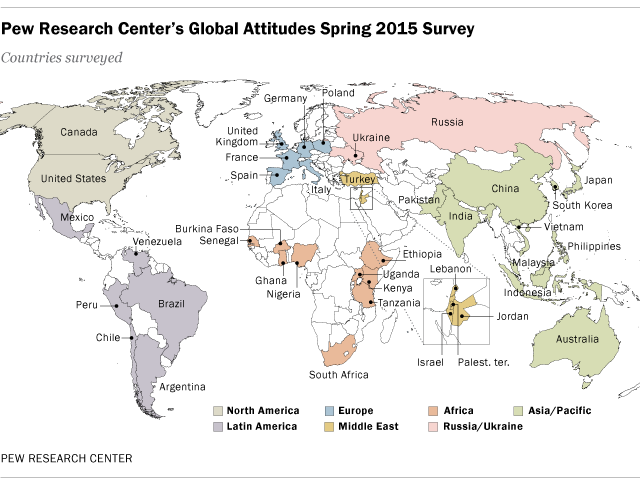 The strongest opposition is in Russia, where 67% disapprove. 2The U.S. image has suffered in Europe and other parts of the world, in part because of its use of torture in post-9/11 interrogations and fallout from its surveillance programs. A median of 50% across 40 nations surveyed say they oppose the use of harsh interrogation methods, which were detailed in a widely publicized U.S. Senate report in December 2014. The U.S. is one of only 12 countries surveyed where half or more approve of their own government using torture against suspected terrorists. The U.S. still gets strong marks for respecting individual liberties of its own citizens. But following revelations of the National Security Agency’s surveillance programs and the release of the Senate report, ratings of the U.S. on this point have declined significantly in Western Europe over the past two years. They have also fallen in the U.S., where 51% said the government respects individual freedoms, down from 63% last year. 3The U.S. is still regarded as the top economic power, even more so than last year, but most people around the world continue to believe that China either will eventually replace or already has replaced the U.S. as the world’s leading superpower. A median of half across the countries surveyed say that the U.S. is the world’s leading economic power, while only 27% say that of China. 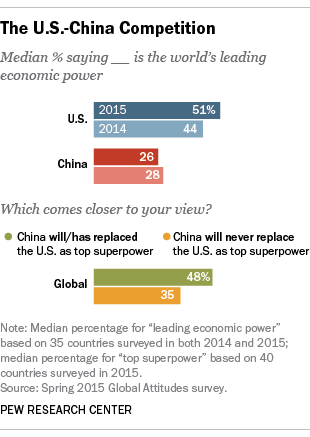 While a median of only 14% say China has already replaced the U.S. as the top superpower, majorities or pluralities in 27 of 40 countries say China will eventually become or has already replaced the U.S. as the top superpower. 4 In its geopolitical rivalry with China, U.S. efforts to “pivot” to Asia – both economically and militarily – have general public support on both sides of the Pacific. Roughly half or more of the publics in seven of the nine nations surveyed that are involved in negotiations on the Trans-Pacific Partnership (TPP) trade and investment treaty, which is being pushed by the Obama administration, say such an accord would be good for their countries, though Americans are among the least supportive. 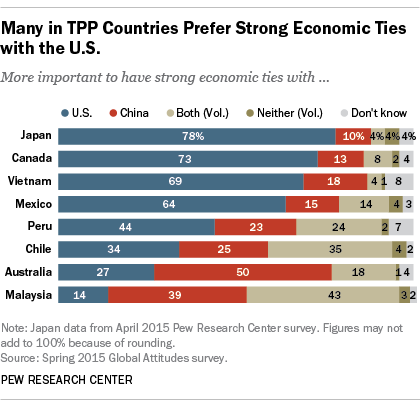 Majorities or pluralities in five of eight TPP countries say it’s more important to have strong economic ties with the U.S. than China. On the military side, half or more of the publics in six of ten nations in the U.S. and Asia think American plans to rebalance military resources to the Asia-Pacific region is a good thing because it could help maintain peace in the region. 5While overall ratings for China among people around the world are mostly positive, that is not the case on the issue of individual liberty. 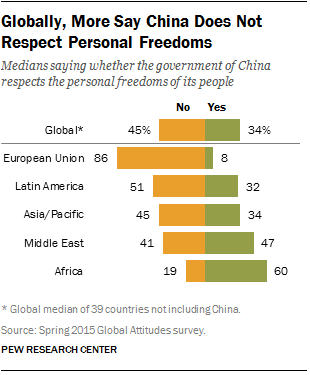 A global median of 45% say the Chinese government does not respect the personal freedoms of its people, while only 34% say that it does. Citizens in the European Union and North America are most likely to hold this negative view. In Asia, publics are very divided on this issue, as are those in the Middle East. People in Africa are the most positive about China’s human rights record.